Every time I read an issue of Star Wars: Doctor Aphra I come away thinking Aphra is a pretty despicable character. After reading Doctor Aphra 25 I found myself wondering if writer Simon Spurrier feels the same. Maybe that’s why, in the final issue of “The Catastrophe Con”, Spurrier provides a of bevy of even-more-despicable characters to favorably compare our girl to. Doctor Aphra is scrambling to escape the clutches of her former employer, Darth Vader, without leaving a trail. Unfortunately that trail happens to be a human being: Imperial Captain – and sometimes lover of Aphra – Magna Tolva. In lieu of Aphra wiping her mind of all of Vader’s secrets and plans, Tolva volunteers to have her own memories erased so Aphra can escape. 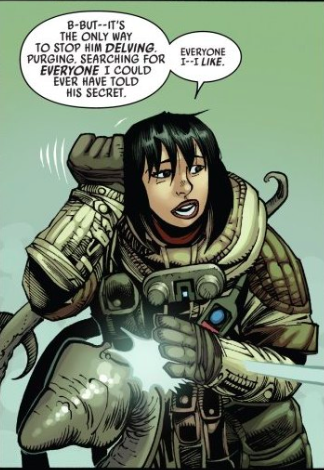 Aphra takes it even further by having the mind-wiping alien Bor Ifriem alter Tolva’s memories so she believes that she killed Aphra. Aphra and Tolva are approaching this situation from slightly different places. Tolva’s sacrifice is coming from a place of love, whereas Aphra can’t even utter the L word – if she is even capable of love. Tolvan has been more invested in their relationship from the beginning, leaving her with the short end of the stick. Of course that doesn’t mean that Aphra doesn’t care. Kev Walker’s standout page of the book shows her passion and anger on full display, igniting the ancient lightsaber. 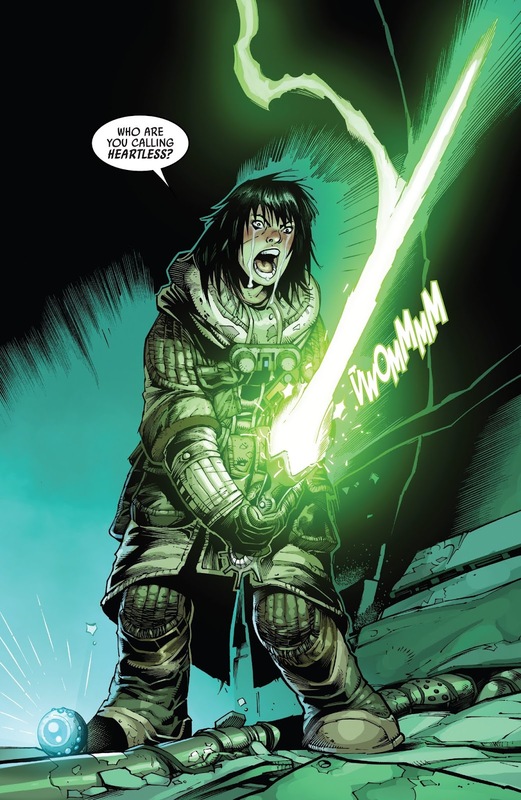 While it’s true that Aphra saved Tolvan some grueling torture at Vader’s hand she also crafted a new reality for Tolvan, one where she murdered the woman she loved. It’s worth asking: are those Aphra’s tears for Tolvan or for herself? Did she love Tolvan or did she just love being loved? Many of us have asked the same in our own lives. Since her introduction, Doctor Aphra has been an opportunist and borderline sociopath who uses and abuses those around her to get what she wants. Doctor Aphra 25 ends with Aphra essentially being sentenced to death. Does Aphra reap what she sows? For a complete list of what we’re reading, head on over to our Pull List page. Whenever possible, buy your comics from your local mom and pop comic bookstore. If you want to rock digital copies, head on over to Comixology and download issues there. There’s no need to pirate, right?